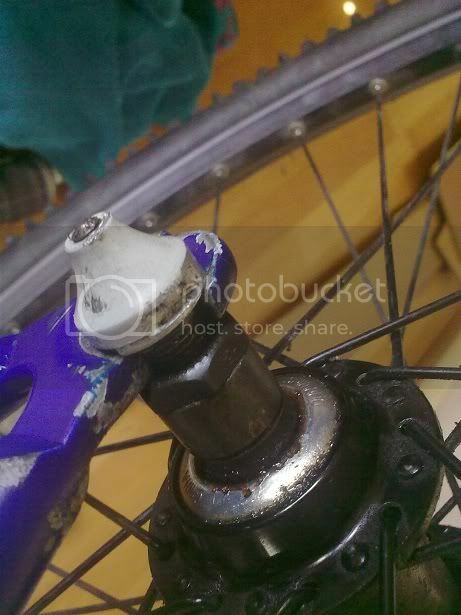 Thread: Dropout/Skewer height safety issue? Set it up with 32/16 & it's so close to the magic ratio but with the axle fully in the dropout the chain is super tight (crank wont spin more than a quarter of a revolution) so I've dropped it down a bit & it's perfect now. Is this a stupid idea that will fail when I least want it too? Should I file the axle a bit? Or the dropout? Or should I just run it? 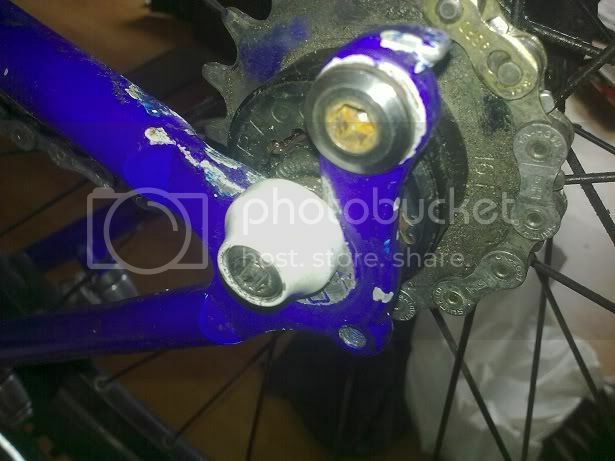 I tried with an extra 2 links in & a DMR tensioner but that's too much slack to take up, got out a BMX chain & a half link but that still needed the tensioner. 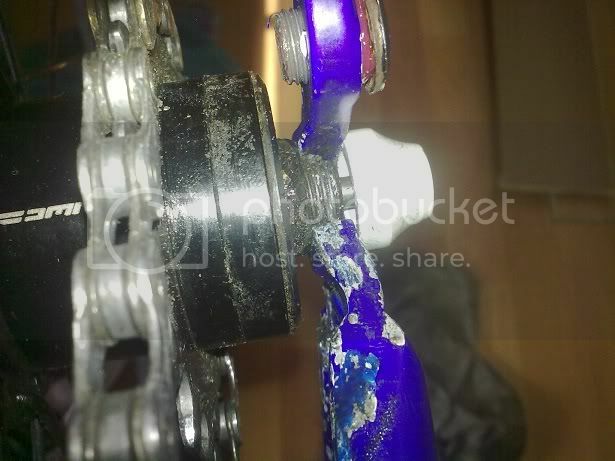 Plus it was BMX chain off cuts & it ran like crap so I took it off. Last edited by JAZ; 07-05-2010 at 04:37 AM. Just run it. With each ride the chain will wear and the axle will fit further into the dropout. Less than 100 miles and the axle will be snug. Last edited by pacman; 07-05-2010 at 08:54 AM. 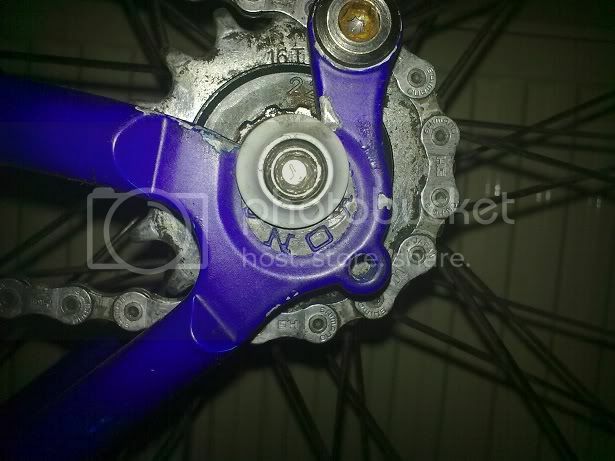 A chain's not going to wear that fast, and I'd be worried about having the axle pull from the dropouts. I'd suggest doing it right, adding the correct half link to a 3/32" chain, and running a tensioner. ^^^ this. If it ain't right, it's wrong. try the half link and a 15T cog. on my Karakoram i had the same exact problem. I dropped a link, added a half link, and went down 1 tooth on the cog, and it fit perfect. 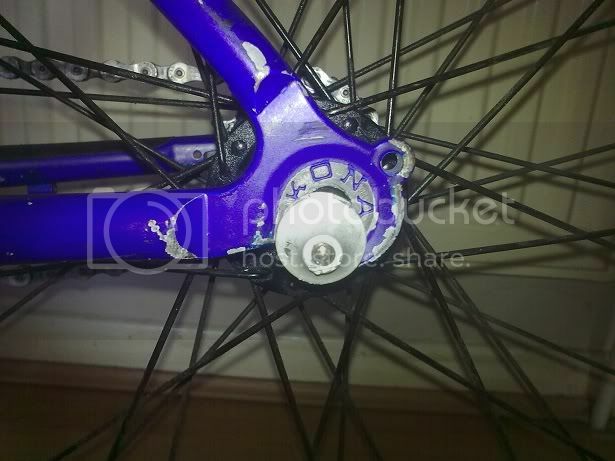 are those spokes spray painted? Exactly how much does it have to wear in order to fit? Thanks everyone, I was eager to just go & ride it this afternoon, so I did! 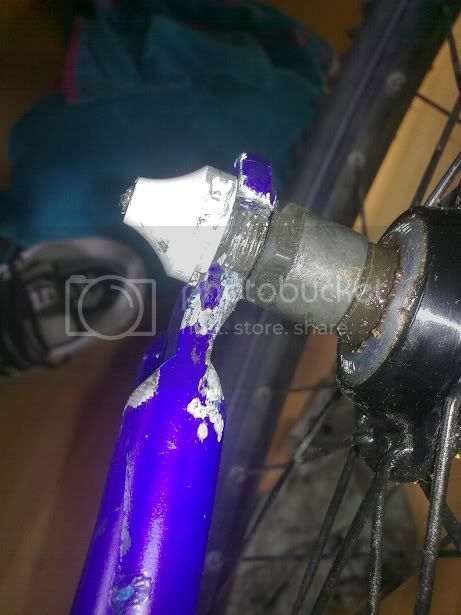 Anyway it held up ok over a short trail I rode, the build had a few teething issues so I cut it short (perished brake pads/bead stretched rear tyre), the skewer in the drop outs didn't move though even though I landed a few little drop off's as badly as I could without crashing. 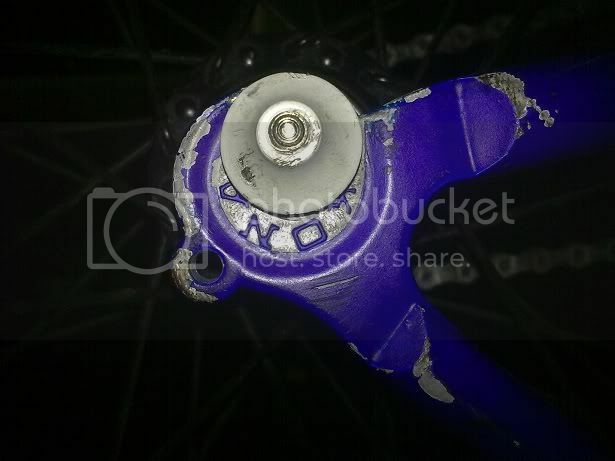 Was hoping to spend nothing on this bike tbh so does anyone have any reason why I shouldn't just file the hub axle down a bit? I reckon I only need a few mm to get it to fit a lot better. Or file the drop out a couple of mm as well, again are these silly ideas that will cause problems or still not give me enough room? The rear wheel is only a very cheap Shimano FH-RM30 sticker'd hub & Rigida Zac2000 rim so I don't care if it messes it up, I just like it's silent free hub. 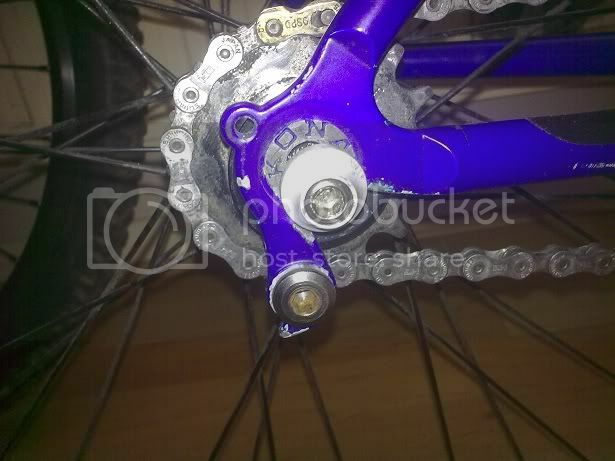 I shall consider following Alex's advice & see if a 15t/half link solves it but only as a last resort as I really don't want to run a tensioner as they ruin the look of SS bikes imo. Nope, they are stock black, just cheap & a bit dirty. by all means, DO file the axle ends flat where it sits in the dropout. this is a pretty common mod, there will be plenty of pics on mtbr and elsewhere...kinda like a poor mans ENO. you can also file the dropouts...make sure you file them slightly backwards and not straight up! my half link/15T recommendation was so you could run the axle all the way in the dropout with NO tensioner. Think I'll try the 'no expense' file option first though, so thanks to BM & Ferday for confirming that for me. Wear it in. As you said the gap is closing and it's closing fast. One more ride and it's good. File it and you'll eventually have a slack chain.